As I’m posting this photo, the classic Monty Python phrase comes to mind: “And now for something completely different.” This is a good example of why I started this Weekly Fifty blog in the first place, which was to motivate me to keep taking pictures and try new things in doing so. The backstory here comes from an early morning when I was awake before anyone else and, thanks to what was honestly just one of those flashes of inspiration you get from time to time, I thought I would take advantage of the very dim light and do some long-exposure photography. I wanted to stay inside in case my kids woke up and started fussing (I like to let my wife stay asleep when those things happen) so I literally just wandered around the kitchen looking for ideas. I found an apple in the fridge, set it on the table, and wondered what I could do to capture a picture of it in some kind of unique way. After a bit of fiddling I realized I could do some rudimentary light painting with nothing else but my iPhone and the built-in camera flash. A quick swipe up from the bottom of your iPhone screen lets you use the flash as a continuously-on flashlight, which turned out to be ideal for adding splashes of light and color to long exposures. I set my D750 on the table and turned on the kitchen light to lock focus on the apple, then turned out all the lights and set my exposure using manual mode. I knew I wanted to shoot at f/4 and wanted a relatively low ISO, but not one that would result in too long of an exposure. The value I decided on for my exposures was f/4, ISO 200, 10 seconds which gave me just enough time to get the images I was trying to make. It began with a nearly pitch-black kitchen, and apple, my camera, and my iPhone. After dialing in my exposure settings I put my camera in self-timer mode to minimize any camera shake and also give me a chance to get my hand over to the apple. With my iPhone flashlight turned on and my finger over the light, I pressed the shutter button and then held my phone behind the apple. 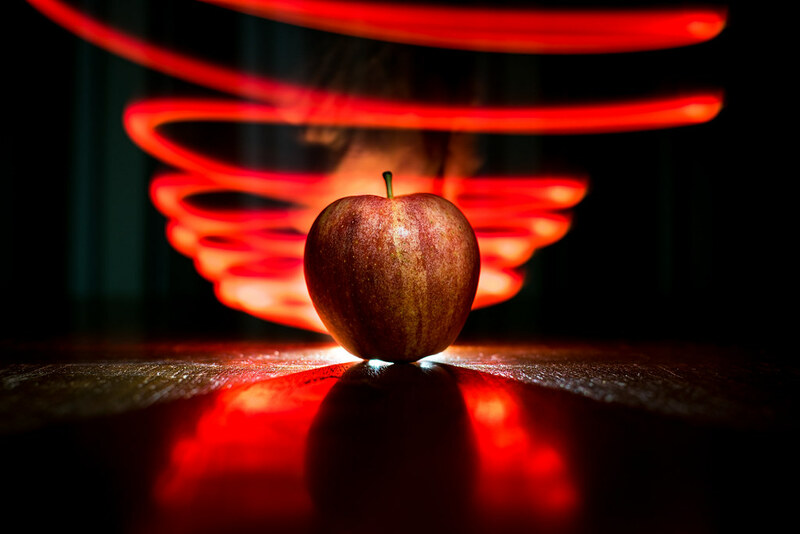 As soon as the shutter opened I slid my finger to the right, which caused the apple to be backlit with a bright white light. After a half second I put my finger back over the light and then moved my hand away in a swirling motion. The red light you see is the light of the camera flash going through my finger, which was not something I planned initially but turned out to be kind of cool. It was fun to play around with this for a little while and I’d encourage you to try something similar, if for no other reason than to experiment with your camera. It’s always interesting to try new photographic techniques, and if you have a camera and a phone you can easily get shots like this…or probably something else way more creative which I would love to see! Very cool. You make it sound so simple. I want to try this now! Thank you Rebecca! Honestly, it wasn’t all that difficult to set this picture up. It just took a lot of trial and error to get it how I wanted. Thank you for writing such a detailed post about how you got this picture. I’ve just taken my first photography class – just starting to shoot in manual mode vs auto and am trying to learn all I can. I don’t think I’m ready for anything as challenging as this yet, but it’s interesting to see how it’s done. I personally like the “smoky” effect of your hand that you tried to get out of the picture. I think it adds another dimension to the photo. Perhaps if you ever do try it again with black gloves you could try a side-by-side comparison. Thanks for the post. I’m glad I found your blog to follow. Thanks Kyla! I’m glad you found this blog but more importantly, I’m glad you are taking photography classes! Moving from Auto to Manual can be a bit scary but it’s also extremely thrilling when you learn how to control your camera to get it to do what you want it to. Good luck and keep up the good work! Thank you for doing this blog. I’m very much a novice, but trying to improve. Your blog is so thorough and so helpful! It’s also inspirational in more ways than one. Thank you so much!